When your car gets dirty you take it to a car wash to get cleaned. But what happens if you’re a fish and you get dirty? You pay a visit to a cleaner shrimp. And if style is your thing, you visit a Lysmata debelius or a fire shrimp. This cleaning machine comes in a bright red finish, accented with white polka dots, sporting three pairs of white legs and six white antennae. 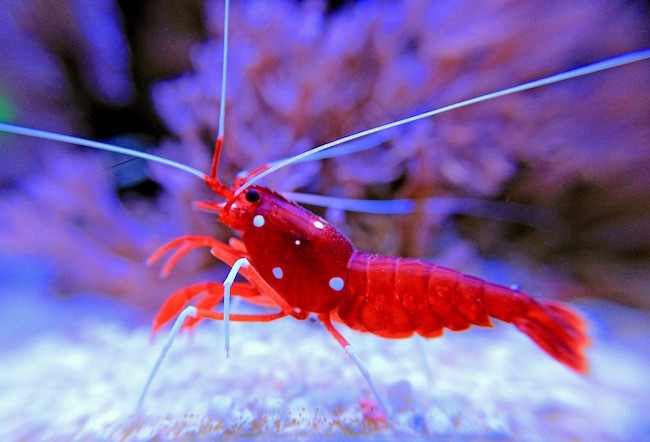 Certain fish depend on this industrious shrimp to clear it of parasites and dead tissue. Fire shrimp set up shop at coral reefs and provide their cleaning service to fish who wait patiently, sometimes in line, to be detailed. The shrimp benefit from the many nutrients they eat off the surface of their clientele. It’s coexistence at its best. Research has shown that a special code exists between the two sea creatures. Shrimp wiggle their antennae to let the fish know they are open for business and the fish turn a darker colour to signal their willingness to be cleaned. When it comes to advertising, using the colour red is always an effective way of attracting attention.